Everyone knows pregnancy is anything but simple. You need to buy new clothes, you are constantly getting bigger and bigger, there are tons of doctor’s appointments, you’re nauseous all the time, the cravings hit you hard and out of nowhere, your feet are completely swollen from carrying a baby 24/7, we can go on listing the hardships of pregnancy for hours. Now imagine being pregnant and having no one there to support you through those nine long months. It’s scary enough bringing a baby into the world, but doing it on your own is a whole other thing. 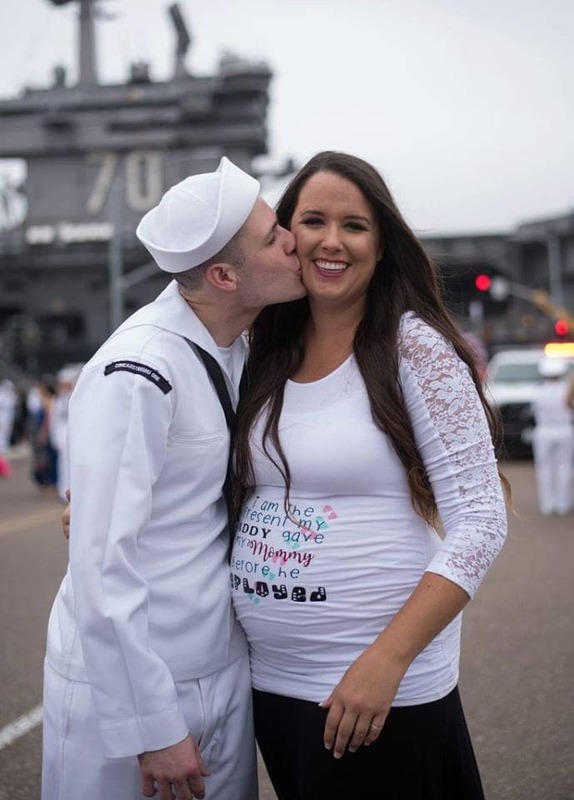 Despite all this, one woman named Natasha Daugherty decided to go it alone, by keeping her pregnancy a secret from her husband, who was deployed on a U.S. naval mission. 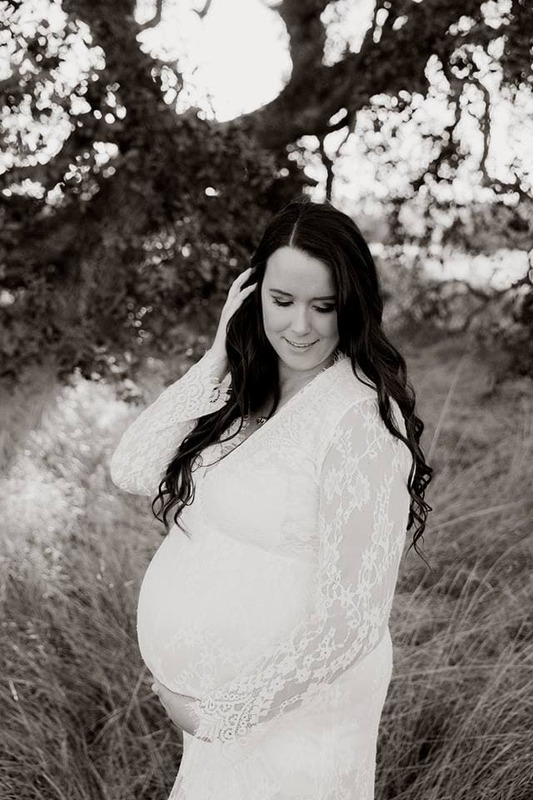 She wasn’t going to tell her husband that she was pregnant by text or through an email. No, she was going to make this memorable. And that is when she concocted a plan that you will not believe. 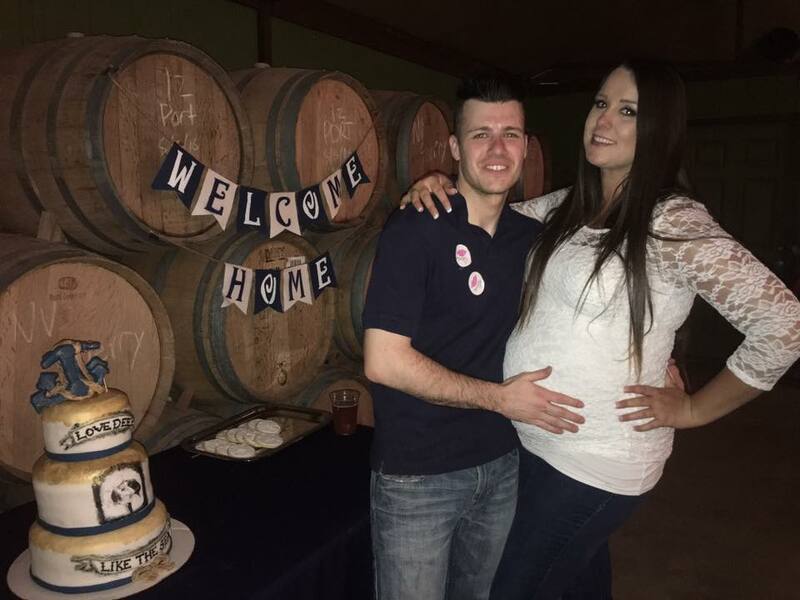 When 27-year-old Chris came back after months of being separated from his loving wife and children, he did not expect to come home to a pregnant wife. How Natasha pulled off the surprise was truly impressive. When this woman has an idea, there is nothing that can get in her way. 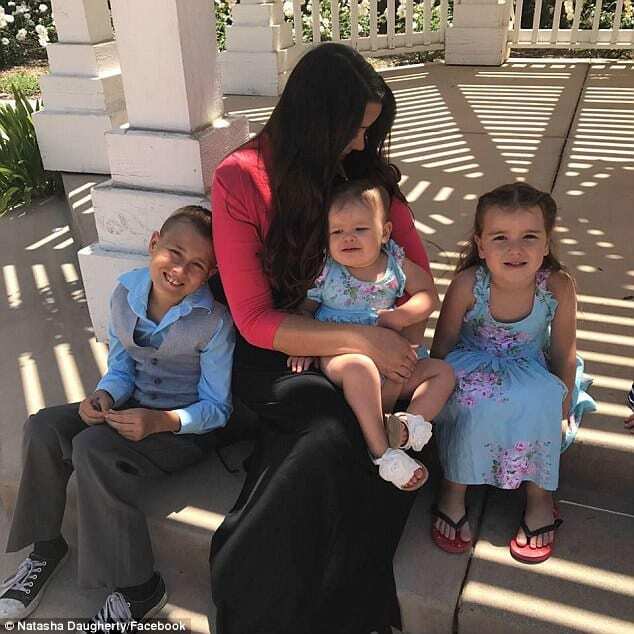 For six long months, Natasha worked two jobs, raised her children and went to doctors offices with the assistance of her husband, all so that her husband could be surprised when he would dock inland after his mission had finally ended. His response to finding out his wife was pregnant the whole time he was away was simply incredible. If you haven’t seen this video then this is the time. The video was originally made only for family and friends, but Chris’ reaction was so good that it was posted online, after which it quickly went viral. 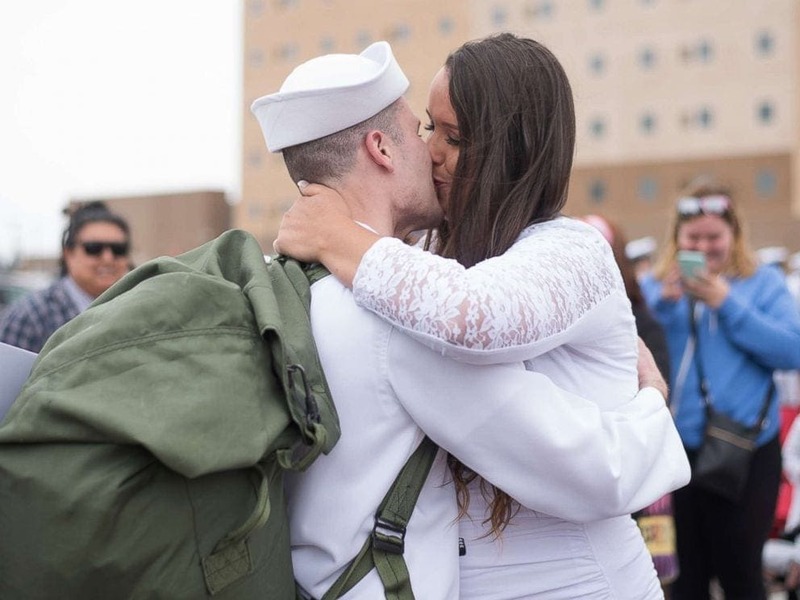 People from all over the world witnessed the emotional reunion between a husband and his wife who were separated from one another for far too long. 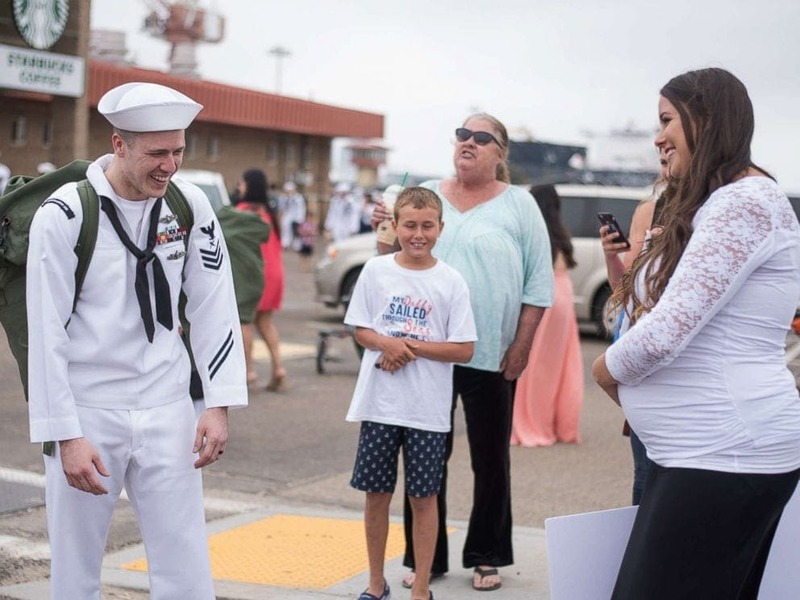 This naval officer did more than just drop his jaw when he found out that their family was about to welcome a fourth child. Check out how Natasha devised a plan so that Chris would not find out that she was pregnant and see how he reacted at the port when his ship finally docked back home. 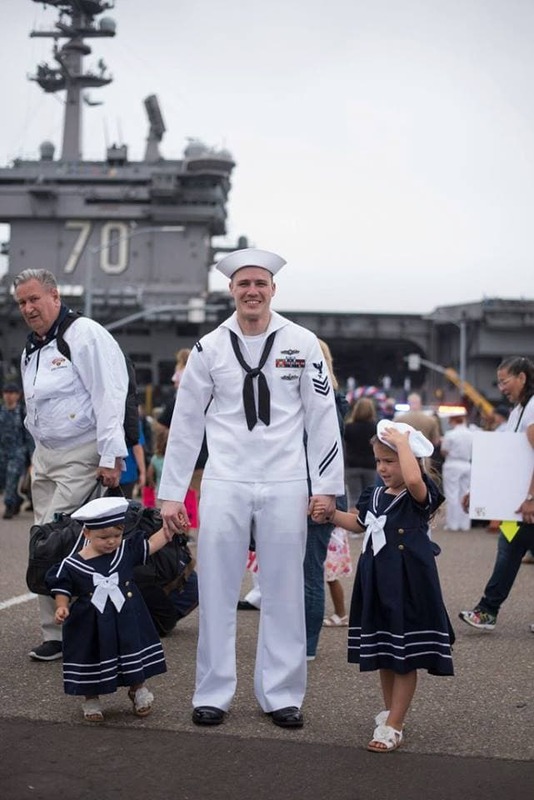 KTLA News covered the most amazing and heartwarming story about a Navy husband and his family. Chris Daugherty and his wife Natasha were the talk of their Raleigh, NC town, before the story got so viral that it became national news. 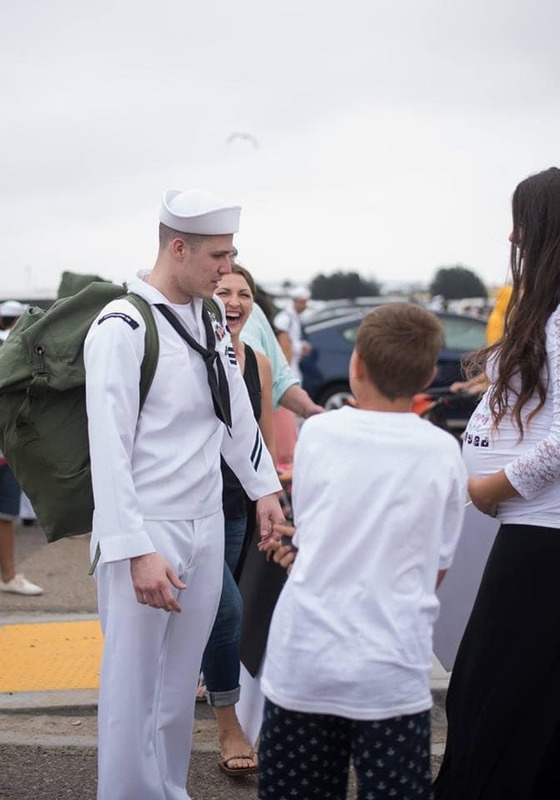 A Petty Officer on the USS Carl Vinson ship, Chris parted from his wife and children to go on a naval mission. He was deployed to guard the Indo-Asia-Pacific maritime borders. However, when he came home, he had no idea what surprise was waiting for him. 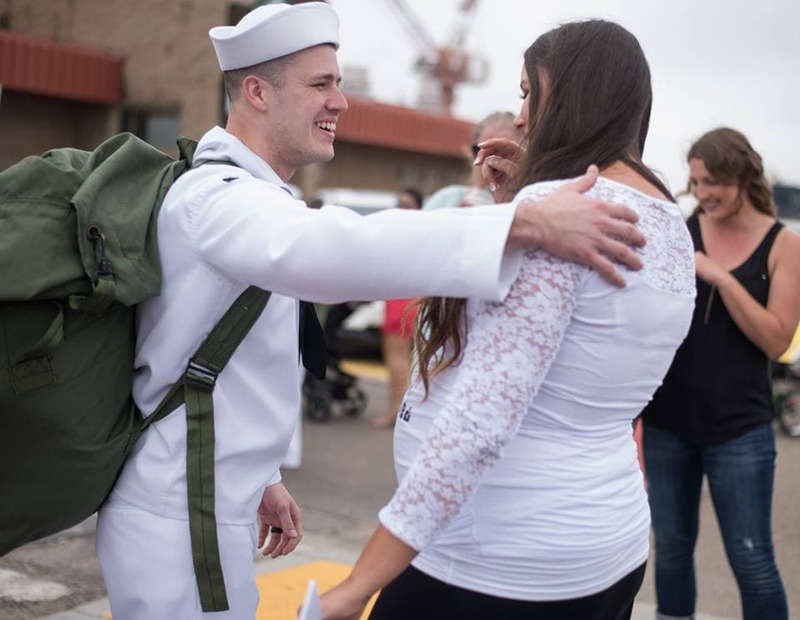 Just after Natasha said goodbye to her husband as he left for what would be a long six-month mission in the Indo-Asia-Pacific on the USS Carl, she received her own surprise. Natasha found out that she was pregnant! Chris wasn’t home for very long and they weren’t even trying to get pregnant. But this happy accident was a blessing. Chris may have been off at seas but she was literally carrying a piece of him with her at all times. The question was, how was she going to tell Chris? Why was Chris’ ship called the USS Carl? There is actually a method behind naming the naval ships. Since the 1800’s the Navy used the Secretary of the Navy to help choose the name of every new ship. All of the Naval Fleet ships start with USS (United States Ship). Then the name placed after the USS is chosen by the public. Usually, the name is coined after a famous or iconic person. Chris’ ship, for example, is called the USS Carl after Carl Vinson who was a Georgian Congressman. If you have ever been curious when and where the US Navy originated then look no further. 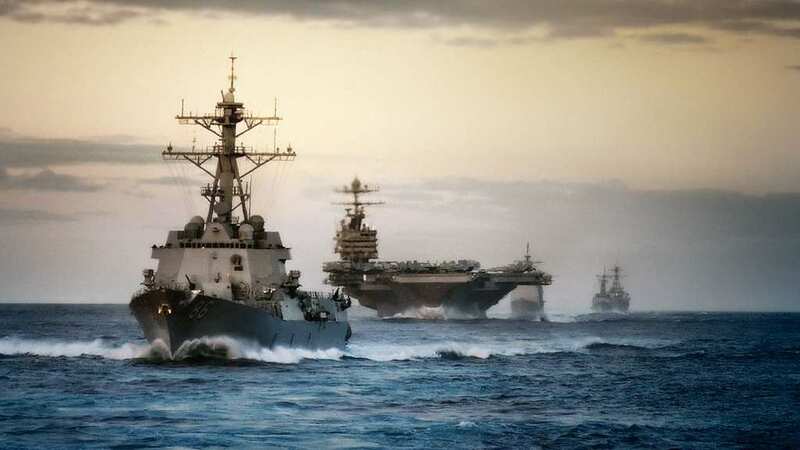 The Navy was first formed in order to assist America to gain its own independence however as soon as the Revolutionary war concluded, the navy disbanded. A little bit over 10 years later the U.S. government officially established the U.S. Navy in order to protect America from Barbary Pirates. 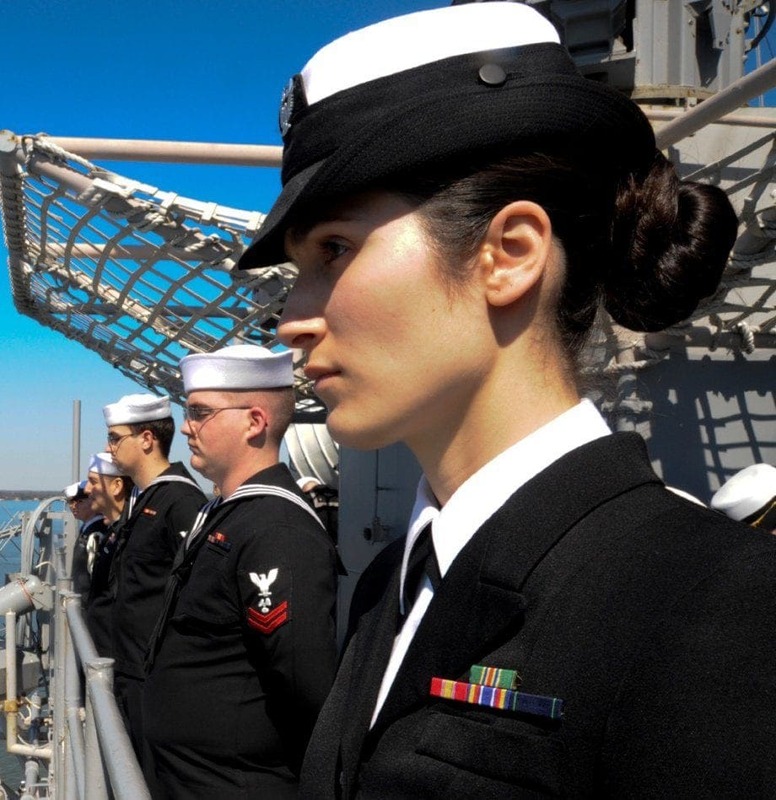 The first time this newly sanctioned Navy was put to use was in the Battle of Tripoli. Natasha decided to enact a plan. She said to herself that she couldn’t just tell her husband Chris that she was pregnant through an email. That wouldn’t have done the enormity of the situation any justice at all. 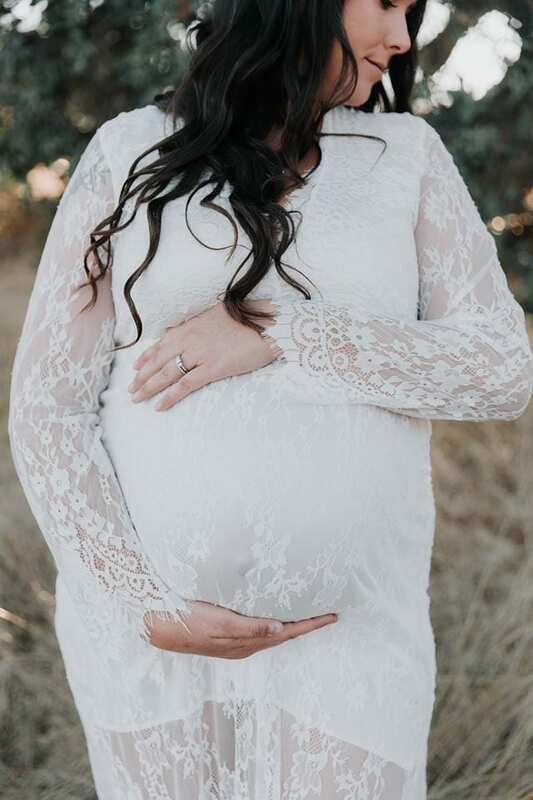 She decided that she wouldn’t tell her husband that she was pregnant mainly because she didn’t want him to feel bad for not being there for her when she needed his support and help. Natasha had to be extra clever if she wanted to truly keep the secret. That meant that every photo would need to arranged just so. Natasha usually had one of her kids on her laps in order to hide the baby bump. But in order to not arouse suspicion Natasha also artfully placed emojis over stomach in some pictures so that Chris wouldn’t get suspicious. Natasha’s Facebook pictures and social media photos needed to coincide with her story, if she was going to make this surprise happen then she was going to do it right. Natasha even had to hide the fact that she was pregnant from her own kids! She said that “I had to tell my 4-year-old I was getting fat,” Natasha admitted, giggling, “Otherwise she would tell! Because she’s a blabbermouth.” Natasha was working two jobs, raising three children on her own and was also pregnant. Keeping the secret wasn’t exactly easy. She was under a lot of pressure and was very stressed but she kept on hold of her secret despite everything else. Keeping the secret got even harder when Natasha found out that Chris was stationed near North Korea. With the news focusing on the tensions between the U.S. and North Korea, Natasha started to worry. Chris was a Navy cryptologic technician and his superiors ordered him to stay for another month. 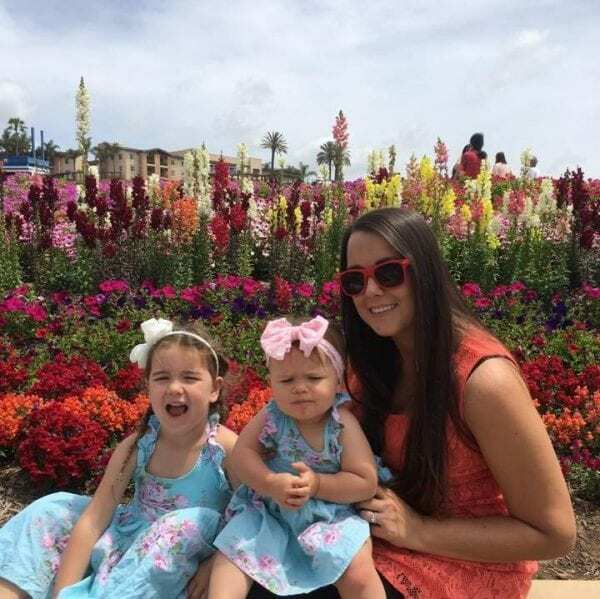 Natasha almost broke and told her husband that she was pregnant “because if something happens, I’m going to feel guilty.” She was scared for her husband’s safety and didn’t know if keeping the secret was a good idea anymore. Finally, the USS Carl Vinson shop docked in San Diego and completed their long mission away from home. Chris thought that he was coming home to only his wife and three beautiful children. He had no clue what was waiting for him. Chris rushed to his three children first and hugged and kissed them relentlessly. Natasha decided to stay back a little bit. 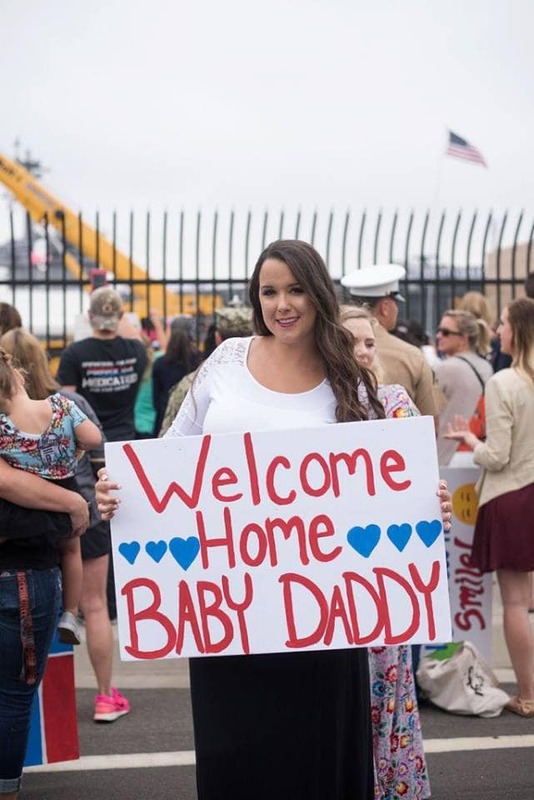 She covered her now much bigger pregnant stomach with a sign saying “Welcome home baby daddy” and he was about to find out what that really meant. When Natasha finally moved the sign to give Chris a hug, Chris admitted that he was “confused.” Her family was waiting on the side to see his epic reaction. Chris poked Natasha’s stomach and said, asking, “Is it real?” Chris really thought that Natasha was actually wearing a fake belly bump as a joke. He didn’t believe it. Across Natasha’s belly was written on her shirt that this was the present that Chris left her with before he deployed. Chris finally believed her and he started to laugh and smile in shock and awe. This was the best homecoming party that Chris could have possibly imagined. He was so excited to meet his new unborn child. Chris was so happy and shocked, they hugged and kissed, both elated about the new member to join their family. Through happy and emotional tears the couple kissed and celebrated. The entire story was caught on camera for the world to see. But there was still one more surprise waiting for Chris. Natasha decided to keep one more surprise for the both of them. Together the couple went hand in hand to the doctor to find out the gender of the child. Natasha wanted Chris to feel a part of the process and for them to find out at the same time since Chris missed so much of the pregnancy. In two months she would be giving birth and it was time to know what they were expecting. 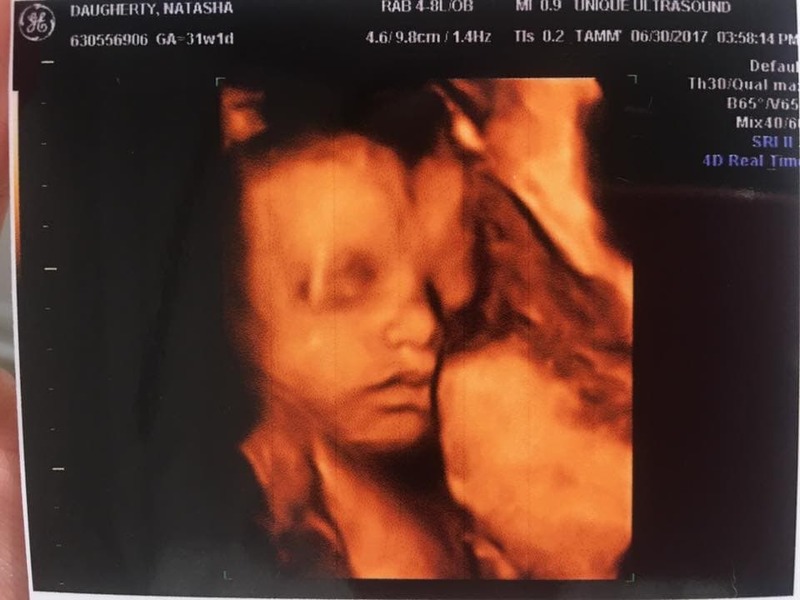 It was going to be a baby girl! Abc news, Fox, The Mirror, NBC, and every other news station you can think of got whiff of this fantastic and emotional story and posted about it immediately. The video from Natasha’s Facebook went completely viral and the news stations added to the video with their own interviews about the aftermath of the surprise. The happy and laughing couple are contagious, the whole world is celebrating with this special family. Chris’, who is only 27 and is a Naval Officer, shocked and awed face is something you just have to see for yourself. 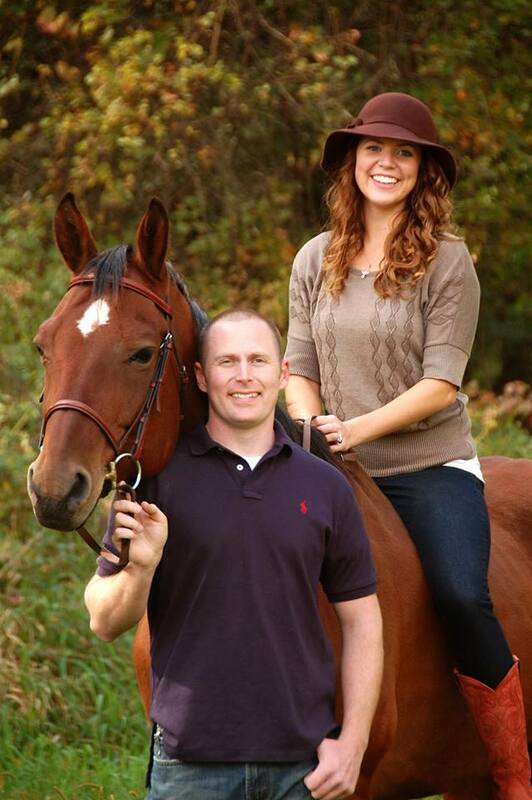 Meet Scott Cartwright and his wife Elizabeth from Ohio, U.S.A. Her husband also went off on an army mission. He was part of National Guard and as a sergeant, he was sent overseas to fulfill his duties in the army. Scott would be gone for 6 months along with his unit which is part of the 121st Refueling Wing in Kuwait. The couple already had one amazing daughter name Nora and they were ready for another. 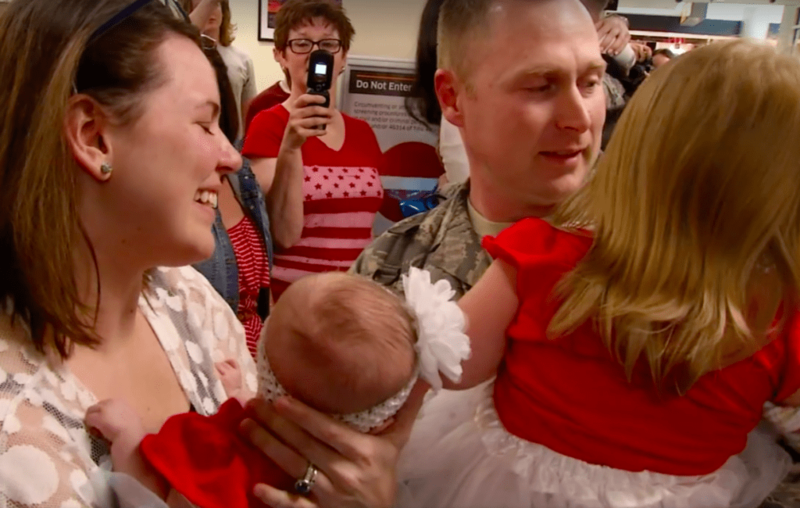 After 6 long months, when Scott finally returned he saw his wife and his daughter Nora waiting for him at the airport. But what he couldn’t believe was that in Elizabeth’s arms was their newest baby girl, tied with the cutest bow on top just like a present. 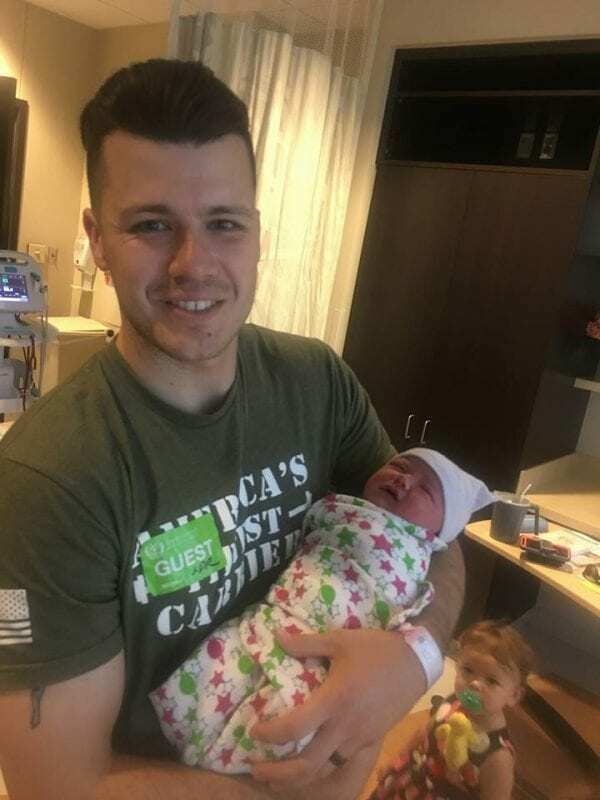 When Scott was first deployed he had to say goodbye to his pregnant wife and when he returned home he got to meet his daughter for the first time. Although he missed her birth, he was ready to be there for the rest of her life. From the second that Scott met his new daughter, he said that “I had tunnel vision, and I couldn’t see,” Scott explained to ABC news. “Probably maybe a dozen people from my civilian job came there, and a dozen people from my church came there, and I was there for ten minutes before I even noticed any of them.” The most emotional part of all was that the couple had infertility issues and had adopted their first daughter Nora. They couldn’t believe the miracle that they had a baby. In September Natasha gave birth to a healthy and adorable baby girl. She announced that their beautiful baby daughter’s name is Anara Rose. Chris wrote on Facebook that “We love her so much! You have completed our family of six!” They posted with this adorable picture that they “Can’t wait to bring you home.” Now Natasha is no longer alone and two have been reunited to share the best surprise that they have ever received. In hindsight was the couple happy that Natasha made the pregnancy into a surprise? 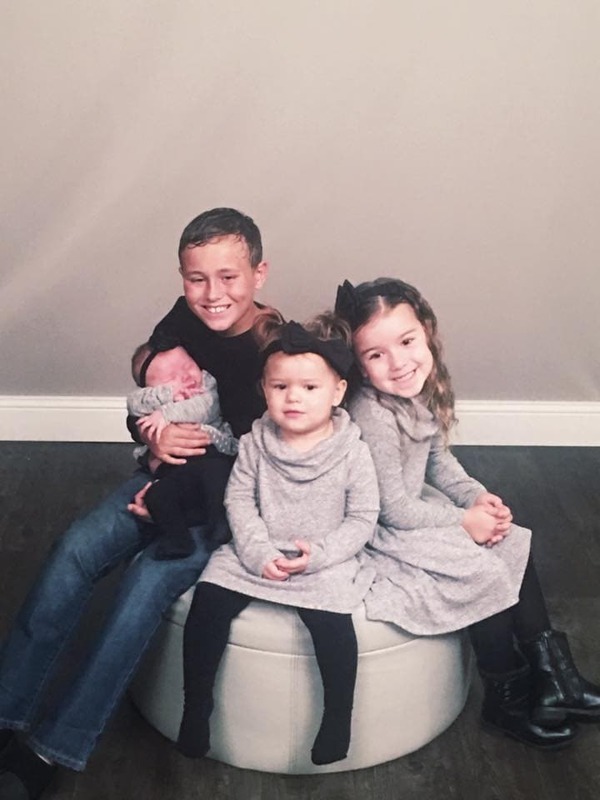 Chris answered in a news interview that “I was extremely happy with the news because we both wanted a fourth child and since it is our last I was happy she did something memorable and fun.” This strong and amazing duo now have four beautiful children in their family and they couldn’t be happier about it. Natasha has more people in her life now to keep her company if Chris gets deployed again.